Now it’s the holidays there is no excuse not to get outside and enjoy your garden (well apart from the weather that is!). If you want some ideas of activities that you can do outside with the kids, then this post is for you. 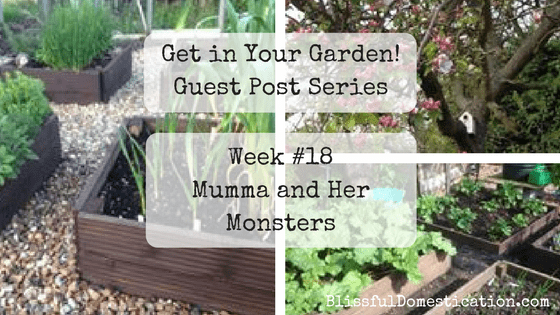 This week’s guest post is by Vicki from Mumma and Her Monsters Blog, and is all about activities that they have enjoyed doing out in their garden when the sun was shining! 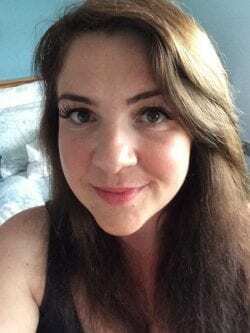 Hi I’m Vicki and I run Mumma And Her Monsters Blog 🙂. I have 2 children and 2 step children and we love trying new activities and playing games. My blog focuses around mental health for parents and how to make life easier with children. 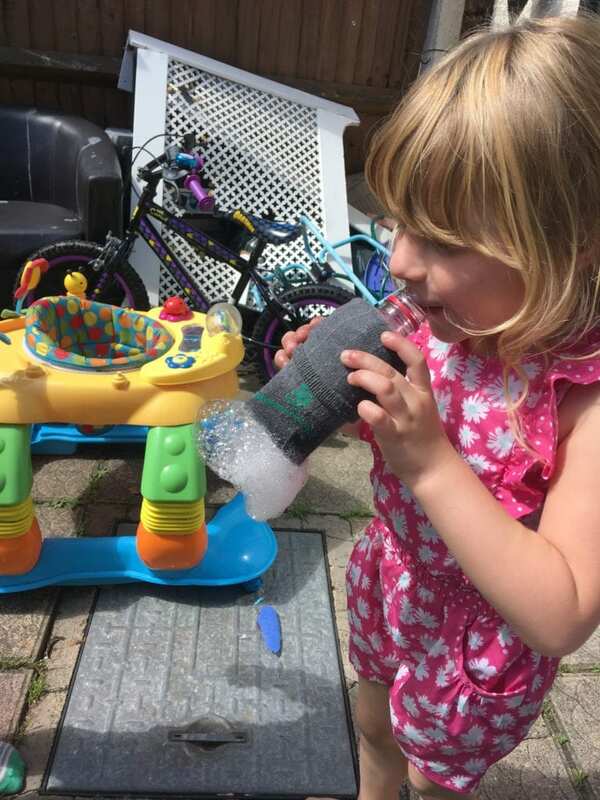 So with the weather being so beautiful and hot we decided to make some ‘sock bubbles’, you make them by cutting the bottom off a plastic bottle, placing a sock around the cut end, dip in bubble mixture and blow through the bottle neck :). 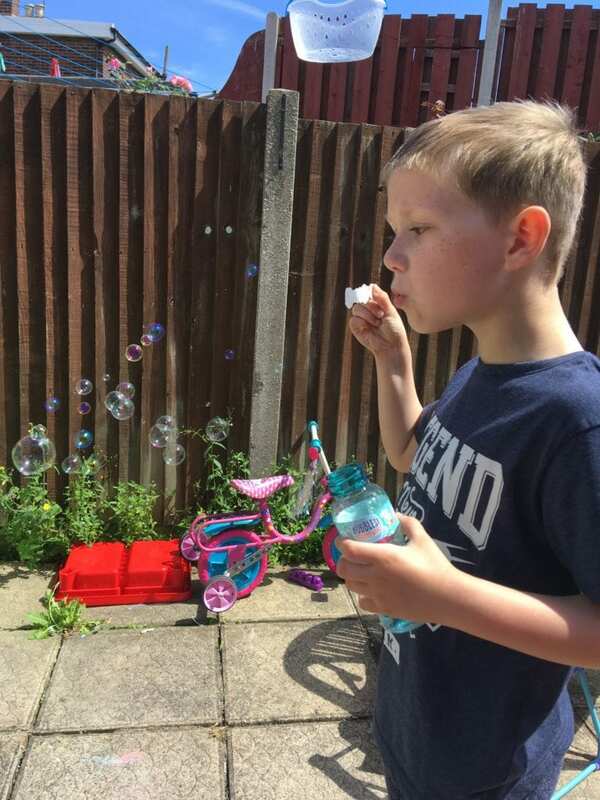 We bought Poundland bubbles and they worked amazing. 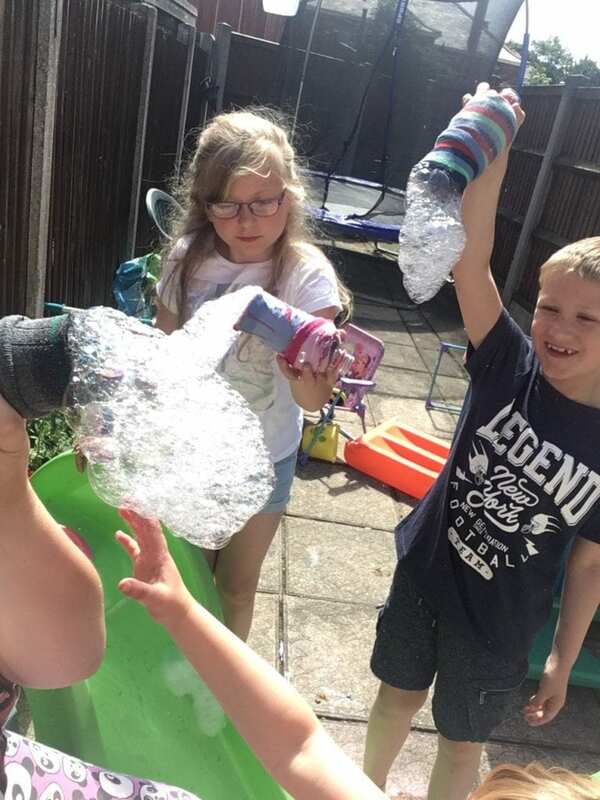 We got lots of foamy bubbles and the kids enjoyed it and had a competition to see who could blow the longest bubble snake! We got out the bubble guns, the wands and blew alot of bubbles too we had alot of fun trying to catch them all. I have previously made bubble wands out of pipe cleaners and sticks but couldn’t find them for this activity. Next we moved onto the stilts. 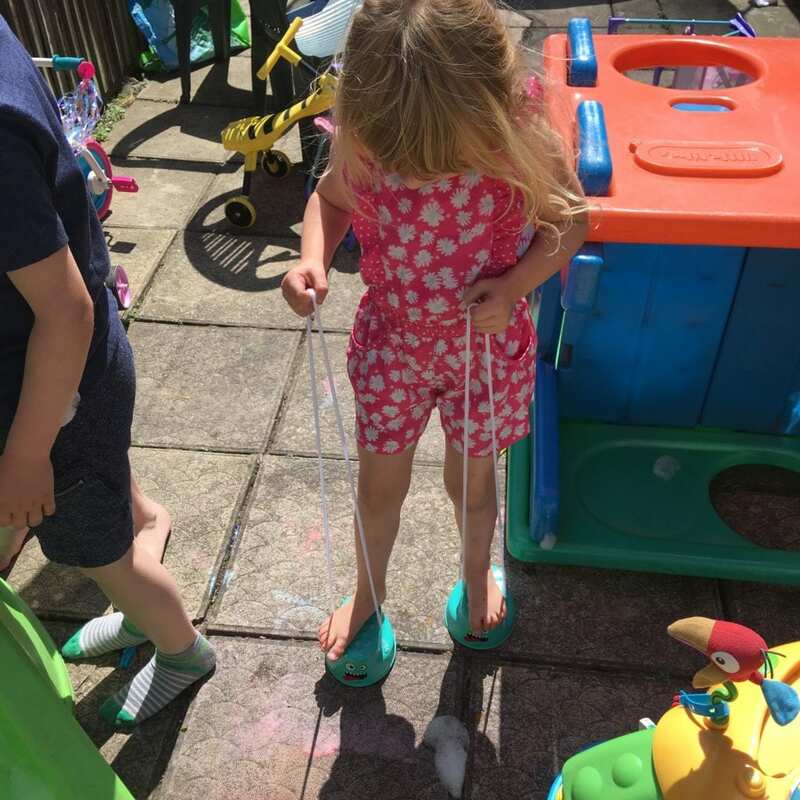 I picked up a cheap pair from Poundland and we had another competition to see who could walk the farthest without falling off. This wasn’t a very long activity and the kids soon got bored of it so we moved on to the next activity. Chalk! We love chalk and play with it a lot. We also got these from Poundland, they’re a big tub of jumbo coloured chalks and they last for ages! We drew giant garden ‘twister’ and I just shouted out left foot red or right hand blue, you could download a app to randomise it but I find it more fun making it up. This worked well for Megan she is the oldest at 8 years old and knew her left and right, where as Lilli (4) and Laten (6) didn’t and I had to help them a little. Whoever fell down first lost so we had lots of fun trying to balance. 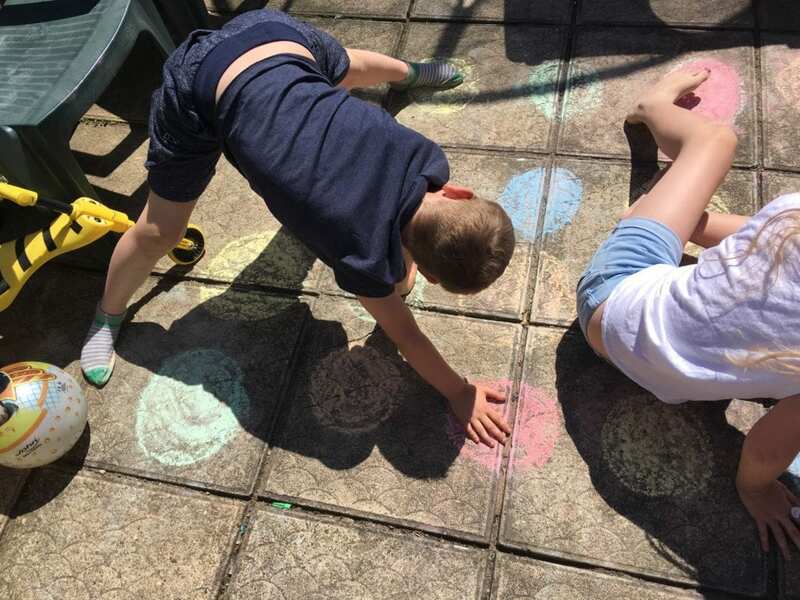 Next it was more chalk fun and we made a hop scotch and had fun trying to do it with just one leg we also just did little drawings and writing messages. 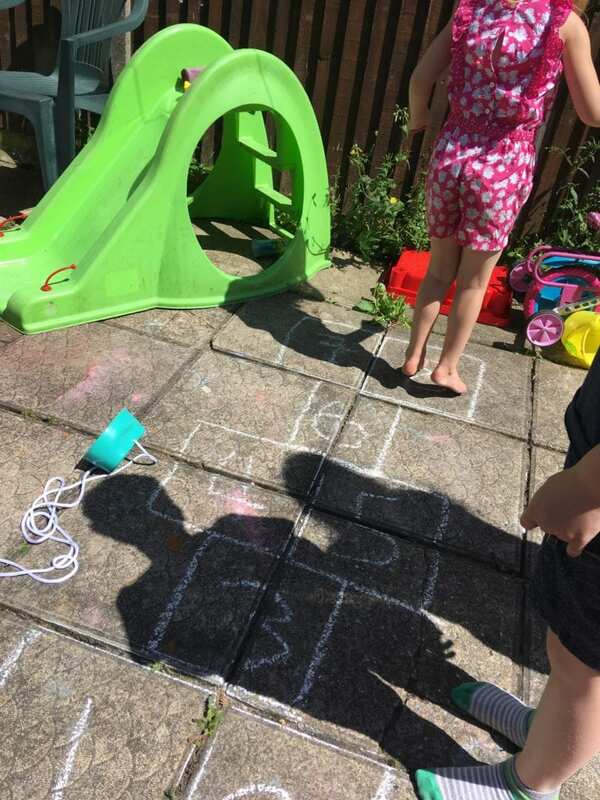 The kids thoroughly enjoyed playing with the chalk and the bubbles and we’re outside all day playing. It was cheap and cheerful, it only cost me a total of £3 for a whole day of fun! It’s a brilliant tip for the summer holidays, a very cheap activity if your on a budget like we are. I really hope that you enjoyed reading and got some good ideas from this to do in your own garden too! Thank you Vicki, some great ideas! I think I need to go and visit my local Poundland and stock up. You can see more of what Vicki and her family get up to at her blog, on Twitter, Instagram, Facebook, and Pinterest. 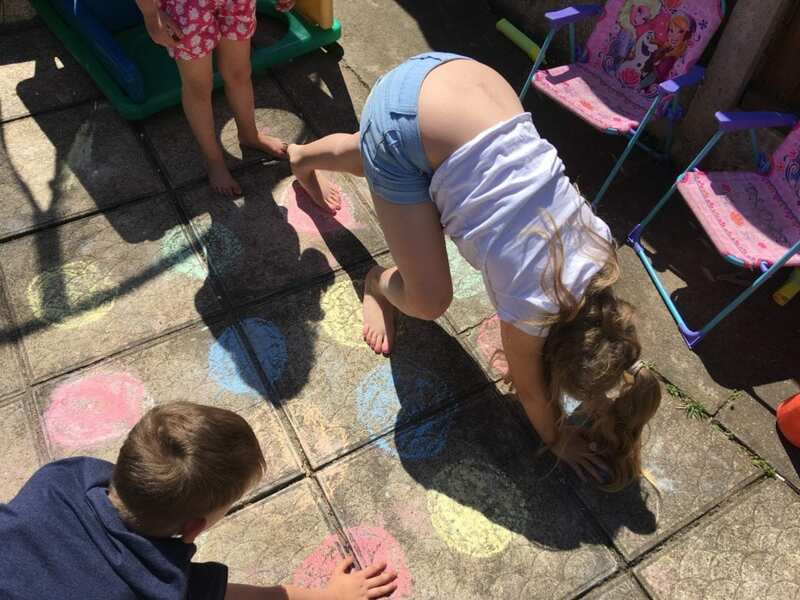 Love the garden twister in chalk idea. I’m going to be using that one when the sun returns. Nice post.great idea. I allow using the sun bar to use.